Digital Parenting is essentially the parenting of connected kids. The Internet opens a new world of information, commerce, networking, education, and job opportunities that were not available to past generations. But with all of these benefits come risks. Cyberbullying, sexual exploitation, identity theft, and fraud are all very real threats to children living in the Internet age. 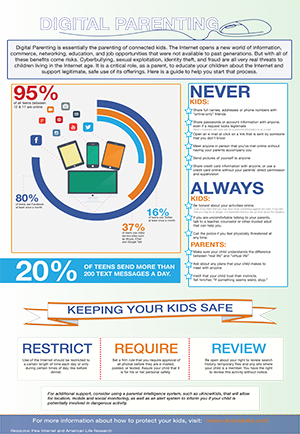 It is a critical role, as a parent, to educate your children about the Internet and support legitimate, safe use of its offerings.